Home Sports Why Talk About Tony Romo On ESPN First Take? Why Talk About Tony Romo On ESPN First Take? On ESPN’s First Take, Stephen A. Smith yelled out before commercial: “It is May. Why is Tony Romo on First Take? That is such a valid question that we’ll ask it again: Why talk about Tony Romo on ESPN First Take? On the show, sports analysts Stephen A. Smith and Skip Bayless, who is white, discuss the latest dramas and happenings in American sports. Unlike in basketball, there is nothing current about the National Football League. The season is on hiatus until the fall, but the producers at ESPN keep on bringing Dallas Cowboys quarterback Tony Romo into discussion. Why? Like Stephen A. Smith pointed out, it is May and football is nonexistent. But the NBA is in full swing. The NBA conference finals are set to start tomorrow with the Golden State Warriors taking on the Houston Rockets on the West and the Atlanta Hawks taking on the Cleveland Cavaliers on the East. The final few matchups should be engrossing with the league’s top two choices for MVP—Stephen Curry and James Harden—set to battle and LeBron James waiting to finish off who survives the West. Much to the chagrin of white media producers, all that’s left to discuss about the NBA are the heroic feats of Black men. That subject has never been a favorite of white media, which is one reason why despite it being May, ESPN desperately attempts to sneak in discussions of Tony Romo whenever possible. Not to mention Tony Romo has done nothing remarkable. Ever. If you check his record, he’s hardly won a playoff game–two in 9 years. His biggest accomplishment is finding himself on a team with superstars: wide receiver Dez Bryant and running back DeMarco Murray. 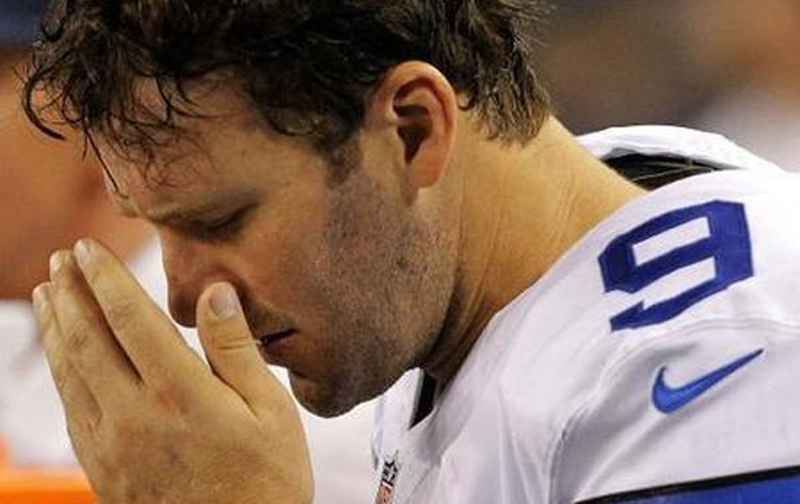 Tony Romo after losing another game with the Dallas Cowboys. Over the past weeks, the producers of ESPN First Take have repeatedly included stories about Tony Romo towards the end of their 2-hour show. The desire to introduce some white man into the conversations about Black men’s basketball heroics is very palpable. This upswing in basketball talk comes at a time when the tainted reputation of white NFL golden boy Tom Brady is also a hot media topic. The ring leader of the Deflategate scandal, Tom Brady is at the center of discussions about lying and cheating. The New England Patriots’ deflating balls was 100 percent to give Tom Brady a competitive advantage over other quarterbacks. Text messages between the ball boys incriminated their involvement in cheating. Although NFL players already knew of Tom Brady and the New England Patriots’ hunger for cheating, audiences are now privy to this information. Being as they are pathological liars and cheaters, Tom Brady and the New England Patriots organization are disgraces to the NFL. The NFL is tainted with liars being crowned the winners of the Super Bowl over a world-class organization like the Seattle Seahawks and their troops Marshawn Lynch, Russell Wilson, Pete Carroll, and the like. With Tom Brady’s integrity vanquished, his Super Bowl wins are meaningless. ESPN needs to deflect attention from the Great White Hope of Tom Brady, now tainted, and shine its light on another white hope. Tony Romo steps into this new spotlight. These May discussions of Romo are a desperate attempt to take the bitter taste of Tom Brady, Bill Bellicheat, and the New England Patriots out of the mouths of NFL fans. And just in case these discussions about Tony Romo do not erase your memory of spectacular Black athletes, the tainted NFL, and the lying New England Unpatriot Bellicheats, ESPN producers ended today’s First Take episode with a discussion of white Green Bay quarterback Aaron Rodgers. Why football, Tony Romo, and Aaron Rodgers on ESPN…in May? Maybe then you would forget the Black heroics that are taking place in the NBA—game-winning shots by LeBron James, Stephen Curry, and Paul Pierce. Maybe then you will think more about Aaron Rodgers and Tony Romo and less about Tom Brady and the tainted Super Bowl that the Seattle Seahawks actually won. Maybe then you will disassociate whiteness from lying! America is still waiting for white police officers to stop fudging police reports and for Tom Brady and the New England Patriots give up their stolen Super Bowl rings. Talking about Tony Romo in May doesn’t change any of that. Previous articleIn Burundi Coup or No Coup?